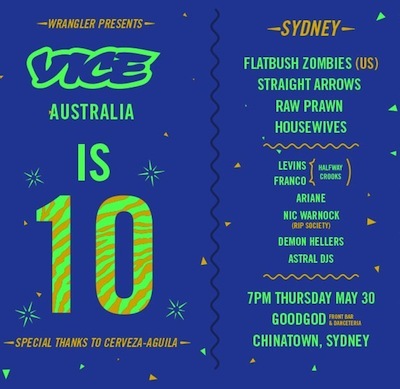 VICE Australia is turning ten this month, which means they’ve spent a decade bringing you a steady stream of the weirdest, most thought-provoking news and culture that’s ever been filmed, photographed, or written about. In classic VICE style, they’ll be throwing an enormous party taking over the entire Goodgod Small Club! Please note ticket allocations for this event are now exhausted. Our Front Bar will not be open to the public on the night, and entry is reserved for ticket holders only.